The Journal publishes the reviews and original papers on cryobiological and cryomedical research, in particular the elucidation of mechanisms of injuries occurring in biological objects and caused by the influence of low and ultra low temperatures; natural resistance of biologicals to cold and their recovery post effect; the development of effective methods of cryoprotection and technology of storage of biological resources under hypothermic and ultra low temperatures, application of hypothermia, cryotherapy and cryopreserved biologicals for treating various pathologies; cell and tissue based therapies and other issues of low-temperature biology and medicine, as well as development of devices and equipment for low temperature biology and medicine. The Editorial Board takes the responsibility to provide a comprehensive peer-review of all submitted manuscripts. The Journal team strictly follows publishing ethics and standards to ensure high quality of scholarly publications. The Journal endorses the International Committee of Medical Journal Editors (ICMJE) Recommendations for the Conduct, Reporting, Editing and Publication of Scholarly Work in Medical Journals. (Read more about Publishing Policy and Ethics). Members of our Editorial Board are the specialists in various fields of low temperature biology and medicine from Ukraine and all over the world. (Editorial Board). We do not charge the authors for article submission and/or processing and do not provide off-prints. The operation of the Journal is supported by National Academy of Sciences of Ukraine. 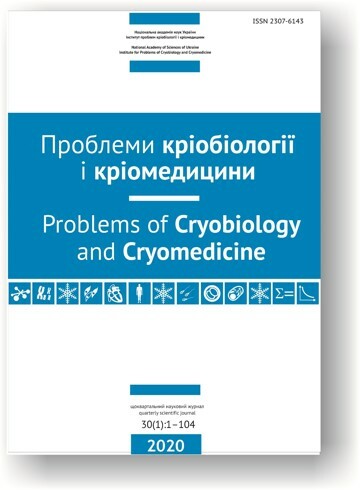 Articles published in Problems of Cryobiology and Cryomedicine are Open-Access articles distributed under the terms and conditions of the Creative Commons Attribution License (CC BY). We provide immediate open access to its content adhering to the principle that making research freely available to the public supports a greater global exchange of knowledge, increase visibility and readership. Use and distribution of the publications are permitted, retaining the credits to the authors and the Journal. The Journal holds the exclusive license to be the first publisher of the articles in print form and on-going non-exclusive license to disseminate the published content in various ways. The published version of the article could be deposited by authors to institutional or public repositories immediately on publication, stating a link to the URL of the published article on the journal's web-site. Our Journal is indexed/abstracted in Scopus, Zoological Records, Chemical Abstracts, EBSCOhost, VINITI, Dzherelo (Ukrainian Scientific Abstracts) and deposited in Vernadsky National Library of Ukraine Repository (2002-now) and Google Books (1975-1990; 1990-2002).